Tragopans are a genus of pheasant that includes five species: Temminck's, Satyr, Cabot's, Blyth's, and Western. Every species except for the Temminck's Tragopan is threatened to varying degrees. In the U.S.A., only the first three species formerly listed are kept in private collections. Temminck's Tragopans are the best tragopan to begin with to acquire experience with. Tragopans are forest birds that nest up in trees in the wild. In captivity, they need to be provided with elevated nest boxes, and their aviary should be spacious with plants, logs, and various high perches. Tragopan eggs are chicken-sized eggs that are speckled with small dots and come in various shades of orange to light brown. The incubation period is 28 days. Being an arboreal species, tragopan chicks are born with flight feathers and can fly immediately. This needs to be taken into consideration with brooder designs, as the chicks can easily fly out and escape if the brooder is not covered. I have found that tragopan hens incubate very well, but I usually do pull the eggs and rear the chicks on my own. When I also had Temminck's Tragopans, I would let the hens raise their chicks and they did a great job. Overall, tragopans are very enjoyable to keep. They tame down quite nicely and have fun personalities. They fare wonderfully in a northern climate and do not mind the cold; however, they do not take the heat as well and need lots of shade during the summer months. 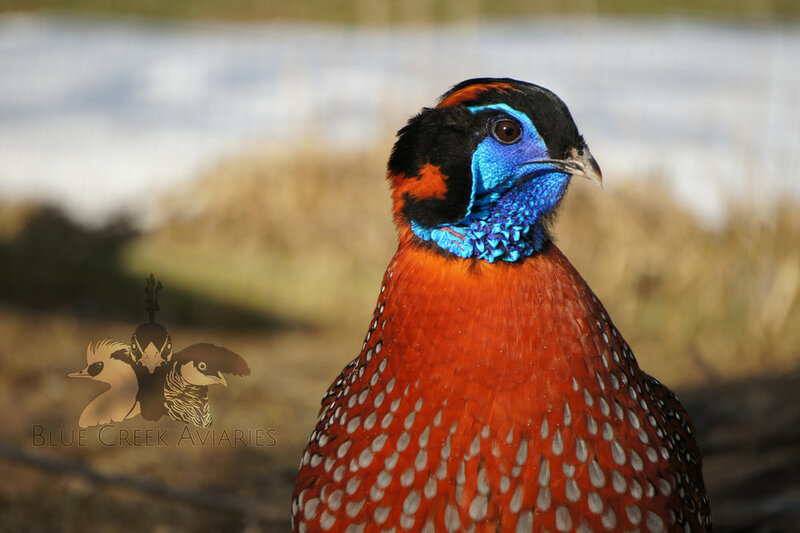 Any tragopan owner can tell you that the males' frontal displays are arguably one of the most stunning breeding displays. The bright facial skin inflates into a lappet and two horns. The lappet length various in size and color based on the species, but each is marked with vivid colors. You will definitely not be disappointed, even though the hens seem to not be as impressed most of the time. Additionally, tragopans are monogamous and should be strictly kept as pairs. If one tries to breed them in a trio, there will be the possibility of the hens fighting. I keep two species of tragopans: Cabot's Tragopan and Satyr Tragopan. Below you will find images and specific information about these two species. Cabot's Tragopan (Tragopan caboti) is a species that is classified as Endangered by the IUCN. They are native to China, where they mountainous forests. Cabot's Tragopan are the most uncommon of the three tragopan species found in U.S.A. aviculture (Temminck's, Satyr, Cabot's). They often have fertility issues, and this can be attributed to inbred stock and limited genetics in the first place. I keep Cabot's Tragopans in planted pens with various aviary furniture. Considering their native habitat, they are not fond of the heat, so they do like to spend lots of time indoors and out of the sun. In the late evening, it is not be uncommon to see the male displaying to the hen behind a log or tree stump. The Cabot's Tragopan hens lay in a prolific fashion that resembles that of the Temminck's Tragopans I used to raise. They readily go broody, but be sure to candle the eggs, as it would be a great energy expenditure on the hen's part to incubate an infertile clutch. Infertility issues are common, so it is not straightforward to breed this species; that is definitely something to consider before acquiring this species. I feed them Mazuri Gamebird feed, wild bird seed, Farmer's Helper UltraKibble, and Farmer's Helper CackleBerry Nugget Treats. This is supplemented with daily fruits and vegetables. I have Ron Sumner lines of Cabot's Tragopan, and they are phenomenal looking. Availability is limited, so be sure to contact me well in advance of the breeding season if you are interested in acquiring any surplus. Satyr Tragopans (Tragopan satyra) are classified as Near Threatened by the IUCN. They are native to the eastern Himalayas. Satyr Tragopan are the largest and longest of the tragopan species. One caveat with Satyr Tragopan hens is that they tend to lay less eggs than Temminck's or Cabot's Tragopans do. Clutch sizes are more typically 4-6 eggs, and anything over ten eggs would suggest that the hen is hybrid. Tragopan hens closely resemble one another, so it is easy for an inexperienced person to mistakenly pair up birds of two species. This is why you should always buy from reputable sources and keep track of all of your birds! Satyr Tragopan were added to the collection in 2016. They are out of Jeff Berger's imported stock and are phenomenal looking. More information and photos will be added as the birds tame down and I have a chance to breed them. I anticipate having singles of Satyr Tragopan available for sale this fall. Please contact me if you would like to be placed on a waiting list for the offspring.